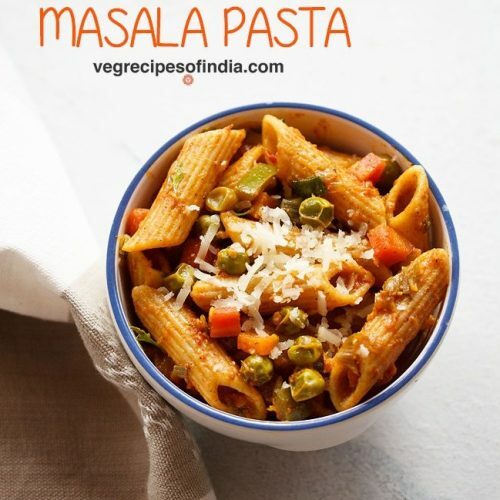 veg masala pasta recipe - simple to prepare tasty pasta made indian style. heat 4 cups water along with ½ teaspoon salt till it comes to a boil. when the water comes to a boil, add the pasta. cook till the pasta becomes aldente. you can also cook it more if you want. heat 2 tablespoons oil in a pan.add the finely chopped spring onions or onions. then add 1 cup tightly packed finely chopped tomatoes. stir and saute on a low to medium flame till the tomatoes become pulpy and soften. then add all the spice powders one by one. next add the mix veggies. add water. mix again. cover the pan with its lid. on a low to medium flame simmer till the veggies are cooked. when the veggies are done, add the pasta. mix very well. next add 2 tablespoons chopped coriander leaves and 2 tablespoons chopped spring onions greens (optional). then add garam masala powder. mix well. switch off the flame. serve indian style masala pasta hot or warm garnished with some coriander leaves or some grated cheddar cheese or vegetarian parmesan cheese.